Mrs. Dorothy Goffe (left) of 810 Dewey Ave., a clerk in the traffic bureau, asks Lauren Jedele of 702 Hutchins Ave., who is applying for a driver's license, if he knows the meaning of the white cane, as part of the program for "White Cane Week." Sponsored by the Ann Arbor Lions Club in co-operation with the city police department, "White Cane Week," scheduled from May 13 to 20, is part of a state-wide program designed to call attention to the white cane as the "traffic symbol of the blind." 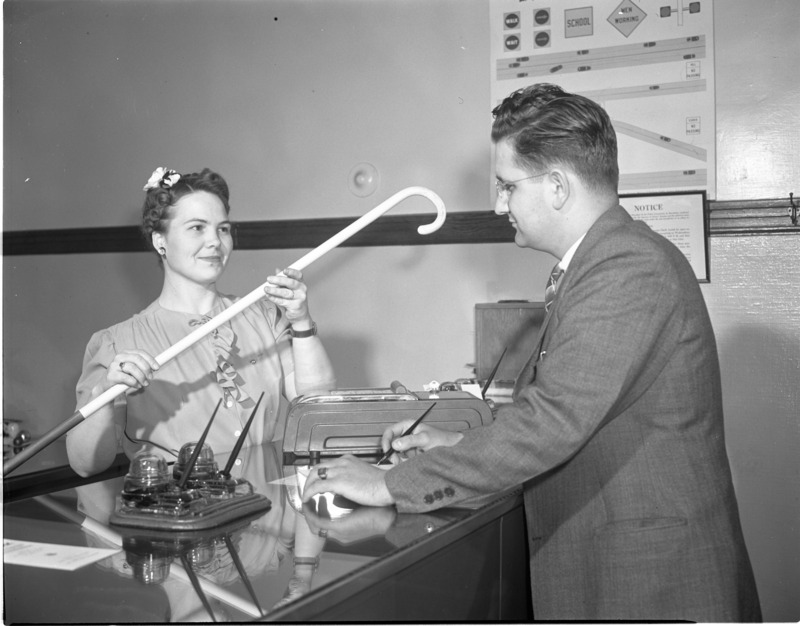 As Mrs. Goffe subsequently explained, a blind person carrying a white cane always has the right-of-way, according to a state statute passed in 1936, and in Ann Arbor, a city ordinance prohibits the use of white canes except by persons wholly or partially blind to help provide protection for them against accidents on streets.